Although the vintage items in the Woolworth Museum still reside in the building as described below, the museum is generally not open to the public at this point. What is believed to be the only Woolworth Museum in the world is located in the Woolworth Building (circa 1950) at 210 West Fourth Street, Oxnard (4th and A Streets). This small, unique museum contains all sorts of nostalgia associated with the F. W. Woolworth Company, one of the original "five and dime" stores. 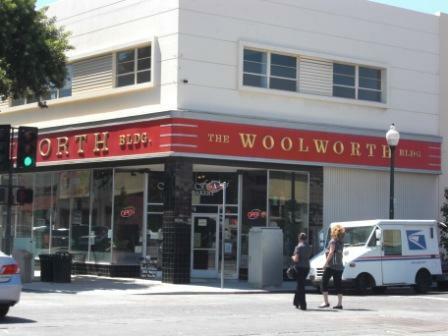 Woolworth closed its stores in 1997. The Woolworth Building is a 16,800 square foot building completed in 1950 that was completely redeveloped in 2003. It is now occupied by office tenants. Many of the old items in the museum exemplify what Woolworths used to sell. Other items relate directly to this building and the people who worked there, including two managers and a woman who worked here on the first day that the store opened in 1950. There are souvenirs from the Woolworth Building in New York, which was the tallest building in the world when completed in 1913. There is a collection of books related to the Woolworth stores. There are several items from old lunch counters, including dishes and menus, as well as some items that relate directly to the pivotal civil rights sit-in that took place at a Woolworth lunch counter in 1960. Photos of various Woolworth stores from 1878 through the 1960s are seen throughout the building. There is a working antique dial pay-phone, a take-your-own photo booth from the 1940s and games and vending machines from the 1930s through the 1960s. There is a vintage cash register, like those found in most stores in the 60's and 70's, displayed so visitors can push down "No Sale" so that the cash-drawer pops open with the familiar ch-ching, bell ringing and all, and the wooden drawer can be examined and closed. Also seen is a 1959 Cavalier 96 Coke machine, which dispenses ice cold vintage coke bottles...at a not quite as vintage price of $1.25. So stop by sometime! Just walk in. No attendants and no entrance fees. The museum is typically open from 7:30 am to 2:30 pm Monday to Friday and 9 am to 2:30 pm on Saturday. For more information and pictures, visit www.thewoolworthbuilding.com (not functional as of 8/6/18). Scrapbooking Forever is a scrapbooking supply store that offers scrapping supplies, classes, parties and more. Located in the Water Court in Westlake Village at 880 Hampshire Road, Suite S.
Visit www.scrapbookingforever.net or call 805.379.4901 for more information. Update 11/3/17: Owners announced via Facebook that they will be moving out of state 1/1/18 but that their online store will remain open. Explorers' Emporium in Simi Valley offers a large assortment of items for creative types in Ventura County and beyond. One of the most unique stores in the local area, there's an entire section containing replicas of dinosaur teeth, shark teeth and other items. There is a huge assortment of archery supplies, Dungeons & Dragons gaming, crafts, steampunk, Renaissance Faire costumes, science projects, board games and much more. Located in the Stone Gate Shopping Center at 5766 E. Los Angeles Avenue (at Yosemite). Explorers' Emporium opened in Summer 2015 but its owners have been providing creative, science and learning programs to the local community for over 25 years. Emplorers' Emporium offers a variety of programs, both on-site and at local schools and organizations, including fossil/dinosaur programs, archaic man programs, Dungeon and Dragons encounters, science/nature workshops, Magic: the Gathering sessions, Tandy leather classes, miniature/figurine painting, music, gaming and more. Visit explorersemporium.com/programs.html for details. Learn more at explorersemporium.com or call 805.791.3002. Dinosaur tooth and claw replicas...I bought a T rex tooth! Visit www.patriotcqb.com or "like" Patriot's Facebook page. Airsoft involves shooting round, plastic BBs from replica firearms. Games last from 6-15 minutes each and people can join at any time during the day. There are referees on the field who orchestrate the games and ensure all players' safety. Players are welcome to come in and learn about the sport, take a tour, listen to a safety briefing and then begin playing! Anyone under the age of 18 is required to wear a full fask mask, which can be brought or rented there. Players can bring their own guns, that will be chronographed to determine that they are within the 350 fps (feet per second) limit of our indoor field. Pierce College Farm Center at 20800 Victory Blvd. in Woodland Hills has a beautiful farm and agriculturally themed birthday party setting with animals, pony rides, farm activities, a 50 foot inflatable jumping pillow, hayrides, cow trains, mechanical rides and more along with a covered eating area. Farm Market open daily from 10am to 6pm. Farm Center Activity Area open 10 AM - 4 PM Saturday - Sunday beginning April 1st each year. Onsite birthday coordinator provided for the 2 1/2 hour party. For more information please call Katherine at 818 999-6300 xt. 21 Or for more information go to www.piercefarmcenter.com.